You are gazing over the clear stream, thinking of fishing the crystal waters in the Rockies. The next morning, you are stunned to see an orange-yellow sludge covering the stream as far as you can see. Is this the Colorado Gold King Mine spill into Cement Creek of August 5, 2015? No, this describes the Clear Creek, CO spill of April, 2009 from a private mine or it could be the 1975 or 1978 Cement Creek spills from abandoned mines. Spills of acid mine drainage (AMD) from abandoned mines have been a problem in the US for over 100 years. How many other mines are leaking or holding millions of gallons of toxic wastewater? And how can we avoid these types of damaging spills in the future? AMD, also known as acid-rock drainage (ARD) and mining-influenced water (MIW), results from the exposure of sulfide minerals, particularly pyrite (also known as fool’s gold), to oxygen and water. Then, biological and chemical reactions generate sulfuric acid and mobilize heavy metals associated with the rocks and ore. 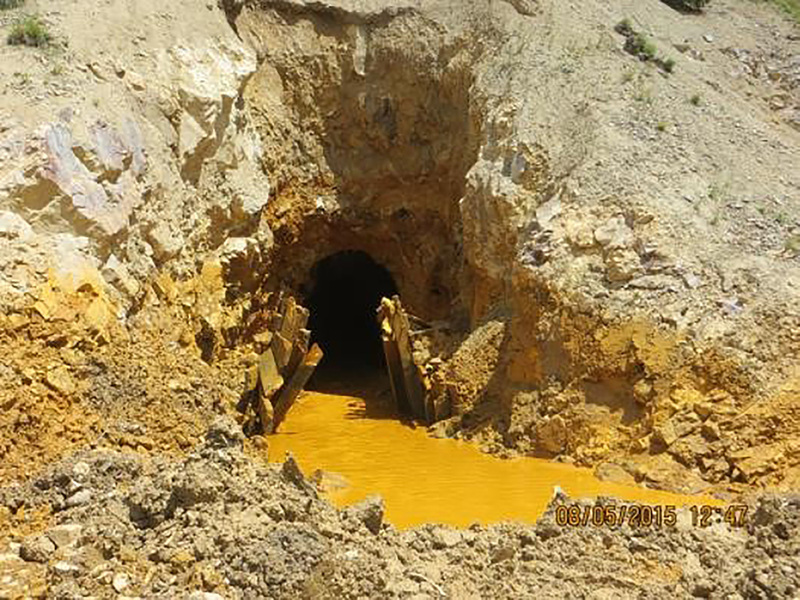 Acidic wastewater with heavy metals spills from the opening of the Gold King Mine in photo released by the EPA. When a mine is dug, eventually water will be encountered. To maintain dry workings, the water is pumped out or a tunnel is dug underneath the work area to drain the water. When the mine ceases operations, the pumps are turned off and the mine begins to fill with water. Under certain conditions, the water, perhaps contaminated with AMD, will decant or discharge out of the mine workings. The predominant AMD generating source in the Western United States is metal mine workings, whose drainage often contains cadmium, lead, nickel, copper and zinc. The Gold King Mine is one of many abandoned mines on the Colorado landscape. The Bureau of Land Management, (BLM) in Colorado maintains an ongoing inventory in the State and in 2008 reported 2,751 known abandoned hard rock mines on public lands. The inventory included 4,670 features of mines, such as draining openings and shafts, and mine waste, that may impact water resources. The numbers of abandoned mines discovered increases every year, rising from a total of 19,000 abandoned mines in 2008 to over 28,000 in 2011. In order to determine the behavior and impacts of the spill, it is necessary to know the chemical and physical aspects of the spill, and the characteristics of the receiving waters. In the case of the Gold King spill on August 5, the Cement Creek has been exposed to input of mine drainage on a continuous basis for 100 years. 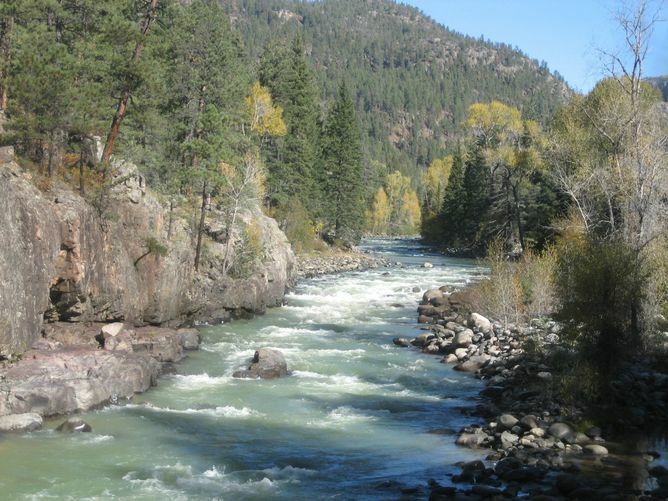 The Cement Creek feeds into the Animas River which then flows to Durango, CO and down the San Juan River to New Mexico and Utah, and ultimately into Lake Powell. Even before measurements were released to the public, we can assume that the water in the spill would be acidic, there would be solid particles containing high levels of iron and some other metals, and that there would be concentrations of metals dissolved in the water above stream standards. Metals become more soluble in the water as the pH decreases and acidity increases. The spill was estimated to be three million gallons, or 400,000 cubic feet (ft3) of liquids. Three million gallons seems to be a large value. However, it is 400,000 ft3 of material going into a stream, Cement Creek, which flows at 8,400,000 ft3 per day. That means the spill is being diluted. Then Cement Creek flows into the higher flow Animas River. More dilution. The spill is ugly but, in my view, it is not as bad as the local government administrators have suggested. The toxic metals will be at high concentrations, but briefly, then will decrease dramatically, as we have seen from previous spills. As the plume of pollution passes, one would expect the water quality behind it to measure at levels seen before the spill. As it moves downstream, the toxic lead and cadmium will disperse and become lower in concentration. By the time the plume reaches Lake Powell, the levels of the pollutants from the spill won’t be detectable. How can I say that the effects of the plume will be temporary and will decrease downstream? Imagine a normal curve with its peak and tails. That is the spill in Cement Creek. As the plume moves downstream, the mixing and turbulence in the stream cause this normal curve to spread out and the peak decreases. The further the plume proceeds downstream, the more it spreads and the lower is the peak value. Some of the solid particles that carry iron and other metals may settle or be trapped on the stream beds. Settling should be minimal because the small particles settle very slowly. Still, some might settle out. The Animas River in cleaner days. The sediment on the bed likely will not be a threat to drinking water and irrigation water because the conditions of the rivers are not conducive to having the metals move from the solid particles and dissolve in the water. Algae on the rocks may take up metals and then the metals might move up the food chain through the insects and then fish. However, I don’t think that there will be enough residuals on the bottom to have a significant effect on the Animas River. The above are and were my predictions, but what does the actual data from EPA say? The water going by Silverton and Durango, CO now is clear and toxic metals have gone back down to pre-spill levels, according to sampling data from the EPA from the week of August 9. Now more than a week after the spill, the water below the confluence of Cement Creek and the Animas River resembles the concentrations upstream of the spill. The US Fish and Wildlife Service put 108 fingerling trout in cages and immersed them in the polluted water for 6 days. One died immediately and 107 survived intact. There were no fish kills in the Animas River. There were no fish kills in Cement Creek that received the spill. Then again, there are no fish or insects in Cement Creek because it has been accepting acid mine drainage for the last 120 years. The released data show the concentrations in the plume decreasing downstream as predicted. Federal officials say initial tests on sediments collected downstream of a mine waste spill show no risk to people using Colorado’s Animas River. The state, too, conducted tests and found that there is not a threat to drinking water or to people during typical recreational explosure. The Colorado Department of Public Health and Environment has collected and analyzed water quality and sediment from the Animas River. The data indicates that the river has returned to stable conditions that are not a concern for human health during [typical recreational exposure]. The San Juan Basin Heath Department concurs with the state health department findings, and advises that there are no adverse health effects from exposure to the water and sediment during normal recreational use (incidental or limited exposure). Still, it was judicious to close the drinking water treatment plant intakes until the plume passed. The rafting companies lost business for several days. But, it is not an epic disaster as some folks have made it to be. So how do mines typically avoid this sort of spill? The common method used to temporarily stop AMD flowing out of a mine is installation of a bulkhead, a 10-15 foot thick, reinforced concrete plug with pipes that permit controlling the flow of water through the bulkhead. Where possible, and where financial resources are available, a treatment facility is built along with a bulkhead to remove metals and acidity from the mine water. The treatment system approach is problematic in remote areas and at high altitudes. The contaminated water is treated with chemicals to raise the pH, reduce solubility of metals and precipitate those metals as solid metal hydroxides on site. The very wet metal sludge is dried and the residual sent off to a landfill. It’s also possible to use microbes to lower the cost of removing metals from mine wastewater. The microbial technology is still in a developmental stage. There are tens of thousands of abandoned mines throughout the US. Most of the mining companies that operated these mines are long gone as are the people involved. Many are leaking AMD into water bodies and have been for decades. Periodically, a water barrier in a mine will be breached and a spill will occur, even without the help of the EPA. Additionally, sometimes a storage dam containing tailings, or ore processing waste, will burst and send contaminated solids and water into the nearby stream. The Bureau of Land Management estimates that only 15% of these abandoned facilities have been cleaned, or remediated, or have plans to be remediated. Until additional resources are allocated by Congress to address the abandoned mine problem, we can look forward to many more abandoned mine spills.